When Sir Stamford Raffles assigned the different groups of new Singapore settlers to their own areas, or cantons, with his town plan of 1822, he may have slowed racial integration and held back the development of a new, unique Singaporean nation for some 150 years, but he did, wittingly, or unwittingly, help to keep their various cultures intact, allowing them to put down strong roots, which in turn allowed them to flourish and to survive into the future. Under the Raffles plan, the British settled the city and the hills to the East, the Chinese, to the South, the Indians to the North and the Muslims, including Malays and Middle Eastern peoples, to the North East. Today, the British enclave is fragmented. All that remains of the nutmeg plantations which once covered the eastern hills is the name, Orchard Road. Most of the colonial mansions that went with the plantations have been swept away in redevelopment. 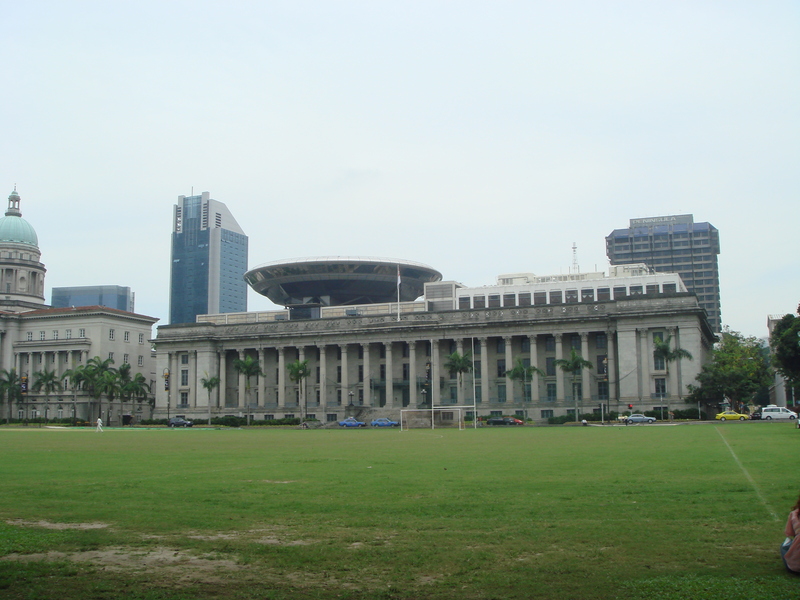 However, there are many grand old dames of British administration dotted around the city like the Supreme Court, the Parliament buildings and the old Post Office, born again as the luxurious Fullerton Hotel. St Andrews Cathedral, survivor of countless Sunday Sermons and Anglo-protestant rites of passage still dominates the landscape around City Hall. The Padang, the Singapore sports ground, is still dotted with figures in white on summer weekends. It still echoes with the sound of leather on willow and with triumphant shouts of “Six!’. Then there’s Raffles Hotel, still standing, an eternal monument to the lost colonial lifestyle, the past age of white linen suits, panama hats, spittoons, vapid ladies in floaty frocks, high teas, peanuts and gin slings. The suits (at least in white linen) and the vapid ladies have gone and along with them, most of the panama hats and floaty frocks while the spittoons survive only as decorations. The gin sling, though, is immortalized now, with a local twist, as the Singapore Sling and the high teas, the peanuts and the peanut shell-littered floor of the Long Bar are still going strong. For a taste of British Singapore, take a stroll along North Bridge Road, through the grounds of St Andrews Cathedral, past City Hall and the Supreme Court, across the Padang, over to the Fullerton, then back to Raffles landing site. Don’t forget to stop at Raffles on the way back for a stroll in the garden and a Singapore Sling in the Long Bar.